NEW YORK --Giancarlo Stanton's first homestand as a member of the New York Yankees went far differently than he or anyone who visited Yankee Stadium this past week envisioned when he was traded to the club in the offseason. "Just got to look at it as a bad week," said Stanton, who heard it from angry fans following a 12th-inning strikeout that ended Sunday's game in an 8-7 loss to the Baltimore Orioles. "The season's much longer than a week," he added. "A couple of good games, and I could turn it around and help us win." Stanton's teammate, the similarly powerful Aaron Judge, is thinking along the same lines. "We're going to look back on this in August and laugh about it," Judge said. "It's just all about us and making adjustments like I know he will. He's done it his whole career. 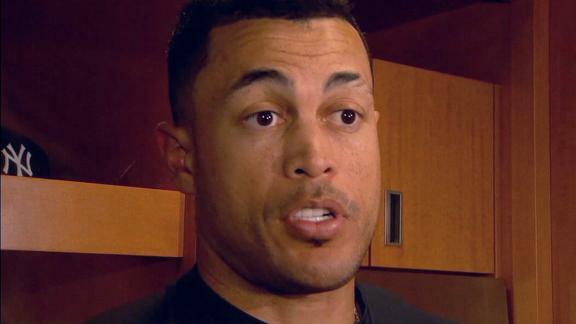 Stanton's a great hitter." En route to claiming last year's National League MVP award, Stanton smacked a major league-leading 59 home runs. Judge led the American League with 52. Stanton's work with the Miami Marlins (he batted .268 with 267 home runs in eight seasons) made him a coveted player this past winter. But after his first 10 games with the Yankees, Stanton has some questioning whether they are witnessing the same player. Along with his 0-for-7, five-strikeout performance in Sunday's loss, Stanton went hitless and posted five strikeouts in his Yankees home debut on Tuesday. "[It's] just timing," Yankees manager Aaron Boone said. "He's got his toe-tap and stuff, and I really believe it's as simple as that. Once he gets that locked in, everything falls in place from there." Stanton isn't completely sure it is a timing or mechanics issue, but he will spend the next couple of days trying to figure out the problem. After a day off Monday, the Yankees face theBoston Red Sox on Tuesday for the start of a three-game series. It will be Stanton's first time participating in the rivalry. "Just got to do more homework. A lot of these guys it's the first time seeing them," Stanton said, referencing his switch from the NL to the AL. "You just got to battle. If you don't feel right, just find a way to battle and try to put the ball in play, which hasn't worked out. But we'll be all right." The boos Stanton heard as the game ended on his extra-inning, swing-and-miss strikeout were similar to those that reverberated throughout the ballpark in the eighth inning, when he went down in another clutch situation. Both booings were loud and cranky. "They're not going to cheer for that," Stanton said. "So what do you expect?" As in his final at-bat, there was a runner on base during Stanton's eighth-inning strikeout. That was one of three at-bats Sunday in which he failed to put the ball in play with a runner on base. Still, Boone remains optimistic that what Stanton is going through is temporary. "When he's right with his timing, it'll start to happen in a big way. And once that happens, he'll get rolling and be a dominant player," Boone said. "Hitting is a grind, and when you're not raking or you're not doing as well as you can, yeah, you think about that. You wear that. You take that home with you. "But you also understand -- and I know he understands -- just how special he is. Once he does lock in that feeling, that feeling we look for as hitters, I don't worry about it anymore. He'll explode." Yankees slugger Giancarlo Stanton reacts to having another five-strikeout game and believes he will be able to turn his slump around and help the team win.